A few weeks ago, I cracked a question that has occupied philosophers for centuries: Can an outfit be cooler than its wearer? The answer is no, yet here I am again, wondering if I am wearing something that is more advanced than I am. 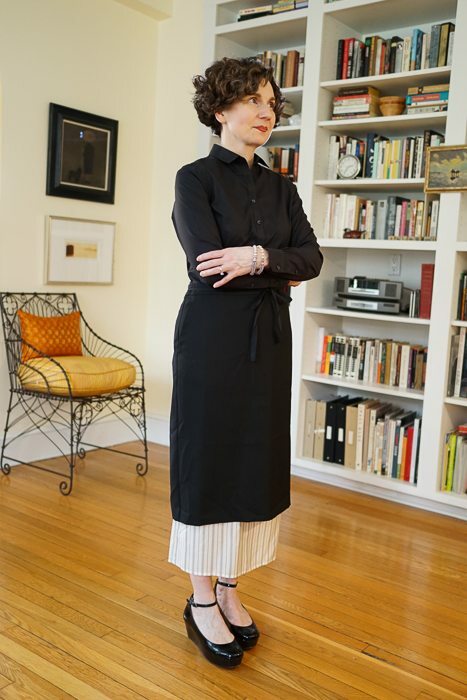 At first glance, you may think that I look like a waiter starting her shift at a Michelin-rated restaurant. I’ll begin by saying: (1) that’s fair; (2) it is a good look; and (3) if you haven’t seen Mostly Martha, you should. But let me point out what is actually going on here. 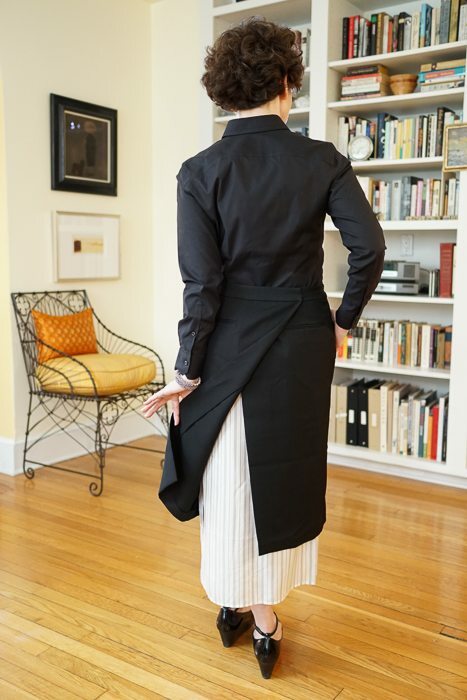 This layered skirt has two distinct elements: a column-style underskirt made of a crisp, striped silk that is covered by a wool gabardine wrap skirt. The underskirt is effectively an insurance policy against the chief risk associated with wrap skirts: public exposure. So much to love about this skirt. The waist is secured with twill tape; slash pockets are flattering and trim. 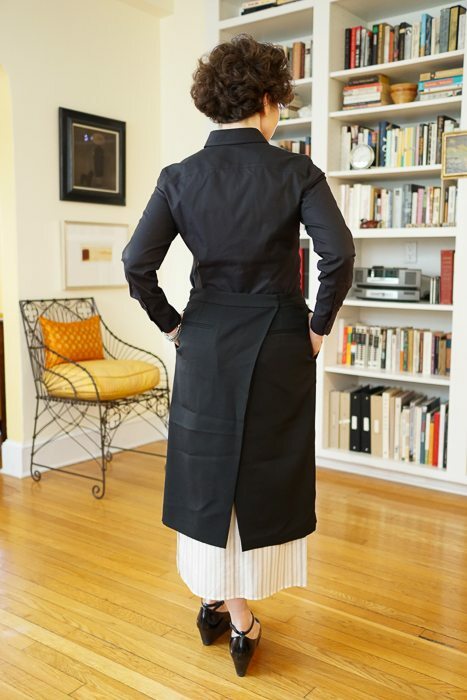 From the front, it just looks like a fairly straight skirt, but the wrap-style creates a forgiving fit which is so nice when sitting down. While most wrap skirts wrap around the front, this one reveals itself in the back, which is so much more stylish, don’t you think? My search for a black blouse to wear with this skirt was longer and more involved than I had thought it would be. JCrew has changed the shape of its Stretch Perfect Shirt and it is no longer perfect me for; the petite seems to be cut for someone a couple of inches taller than me. Talbots Perfect Shirt — which is perfect for me — is not available in black at this time. I ordered a similar shirt from Banana Republic and found that it had no shape. Brooks Brothers! I found a petite shirt in black — their Tailored-Fit Non-Iron Dress Shirt . . . as distinguished from their Fitted Non-Iron Dress Shirt (which does not come in black in petite sizes) — that was exactly what I wanted. Altogether, I ordered eight of these blouses, in various sizes, in order to find one that actually works. 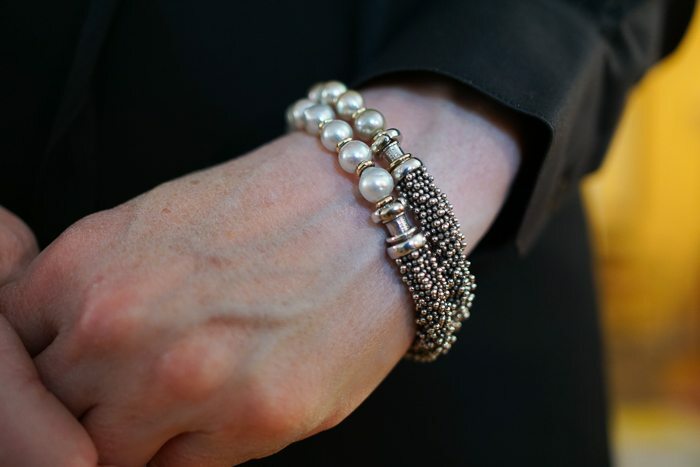 To finish things off, a little jewelry. Something interesting but subtle that would not detract from the simple lines of the outfit. For shoes, I thought these platform shoes — which are oddly graceful — were a better choice than boots. The Photographer says he doesn’t know how he feels about the underskirt, but I think it makes the skirt. I must concede, however, that in making the skirt, it is making the skirt less versatile. This is not a utility skirt that can be paired with any blouse or jacket. In fact, I can’t think of a single jacket that I would wear it with (too much bulk) and only envision it with slim-fitting and very lightweight sweaters and blouses. 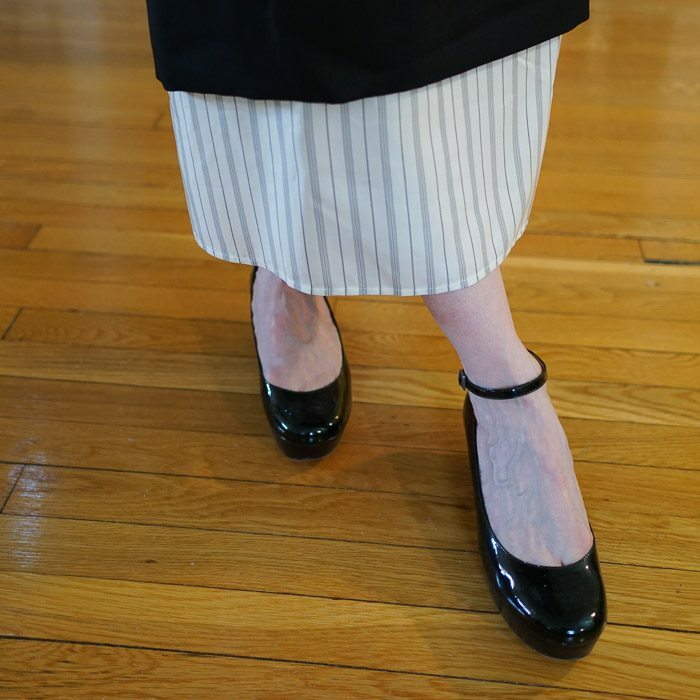 I am thinking of making an alternate underskirt — black silk with thin white or grey stripes — so that I can wear the skirt with a cream or white top and black boots. I’ll let you know. I love the idea of the underskirt—very different & lovely. Would you not consider shortening the underskirt some? I can see how the thought of an apron comes to mind—it could be the tie? You could easily remove that and wear a normal belt instead!! And I’d be interested to see a print blouse/shirt with this ensemble…I’m not sure I’m a huge fan of the all black on top. I do love how you are so willing to venture out of the box….bravo!!! It is wonderfully unique and perfect for your small frame! The shoes… the shoes… I have swooned at my desk. gk, you spoil me! I have been more interested in Jil Sander than Marni lately. Also, those shoes are perfect! Where did you get them? Hi Jennifer — I am so glad that you are enjoying the blog. I wish that the shoes were still available. I bought them from Zappos, but it was about 7 years ago. (I don’t wear them often, so they are in excellent condition.) I did a quick search to see if they might still be out there on the Internet and although I found a few images, I didn’t see a pair for sale. You might try Orla Kiely and FitFlop (FF2) to see if either has something similar. If you find something, let me know. I’m with Jodie in thinking that the underskirt could be a little shorter. I also think you could get more wear out of it alternative underskirts. Maybe that’s the one to try a little shorter. I might consider a subtly bordered material unless it hints at a petticoat, which I think you want to avoid. It is an interesting skirt and I can imagine that it would be good for work in that it’s slim while standing but moves well when seated, without the thigh-barring front slit.